Tonight the Red Sox, my favorite Junior Circuit team, and the Cardinals, my favorite all-time baseball team, square off in Game one of the 2013 World Series. Don’t tell MLB, but it’s really just the Championship of the U.S. since we don’t invite the rest of the world or other planets. Anyway, in 1967, I was a died-in-red-wool Cards fan emulating Bob Gibson’s pitching mannerisms in my back yard and Orlando Cepeda’s eccentricities in the batters box of my young mind. 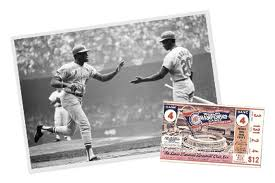 We were fortunate to see one baseball game per week on NBC’s Saturday Game of the Week and perhaps two or three Cardinal games were shown each season. And the occasional UHF Sunday afternoon game could be seen through a snowy black and white antennae feed. So watching a game with the Cards on television was a real treat in 1967. 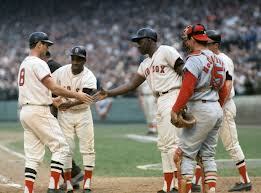 The 1967 series went seven games with four played in Boston and three at Busch Stadium II which was built in 1966. The longest game lasted 2:48 and the shortest 2:05. Bob Gibson won three of those and he pitched faster than Michael Wacha with his hair on fire. Tonight’s game will feature cold weather gear and at least an additional hour to pay for the salaries of our heroes through commercials. There certainly were fewer commercials in 1967 and the games were all in the day which meant I had to sprint home each day from school to see the last few innings on our console television after catching the early innings on a small transistor radio at recess or clandestinely at my unidesk in Ms. Solomon’s class for the gifted and strange. My, how times have changed since 1967. Tonight I’ll pull for the Cardinals and revel in their success and admire all the kids playing for them and the Cardinal Way they’ve been talking about in the newspapers. I’m proud of the Cards. I just hope they finish the game before I fall asleep. I still can quote the entire lineup including subs of the 1967 Cards as well as many of the Red Sox. I’m pretty sure that I won’t be able to say that about the 2013 Cards in ten years. It’s like my Grandma Taylor’s stories…her memory wasn’t really any better than anyone else. She just repeated stories over and over and over until it burned into her memory, so the further away the memory, sometimes the closer it seems. Or maybe I’m just old. Enjoy the game and go Cards! I remember when I was 15 years old being at the Cardinals, Giant’s double-header in St. Louis on Monday, May 2, 1954 when Stan Musial hit 5 home runs. He raised his batting average to 400 that day. That was quite an afternoon for a 15 year old potential baseball dropout. I only read about that Musial feat but you saw it. I’m envious. You probably held on to your money unlike me.